These delicious and melt in mouth ladoos can be made at home with an easy to follow recipe. 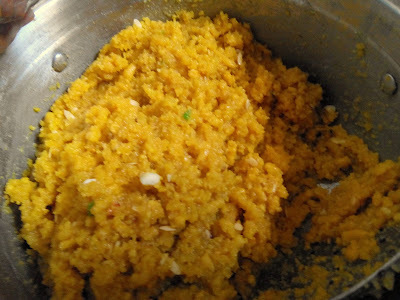 Here instead of making boondi , Sev is made from the besan flour and the sev is then crushed and the coarse powder thus obtained is mixed with sugar syrup. 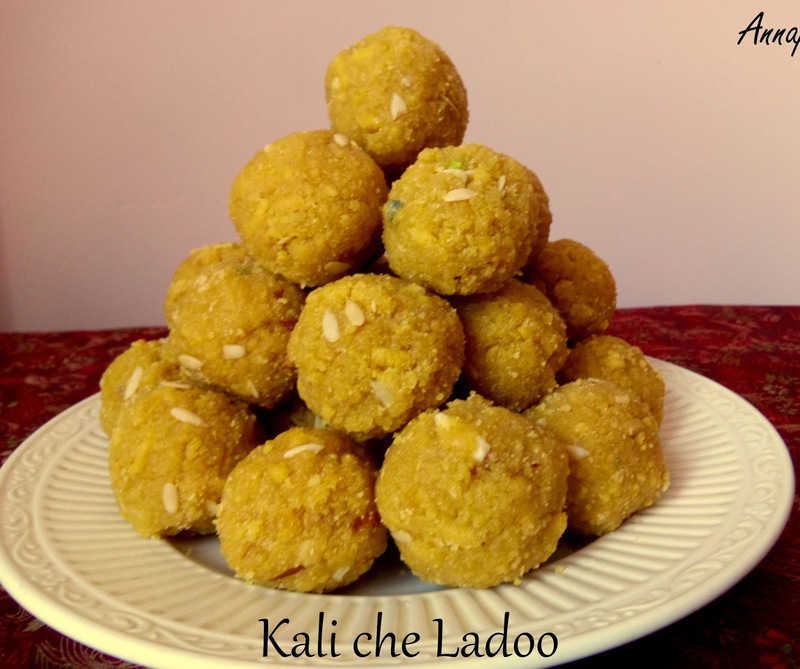 The crushed sev appear as small curves ( kali in colloquial language) and hence the name of the Ladoos. 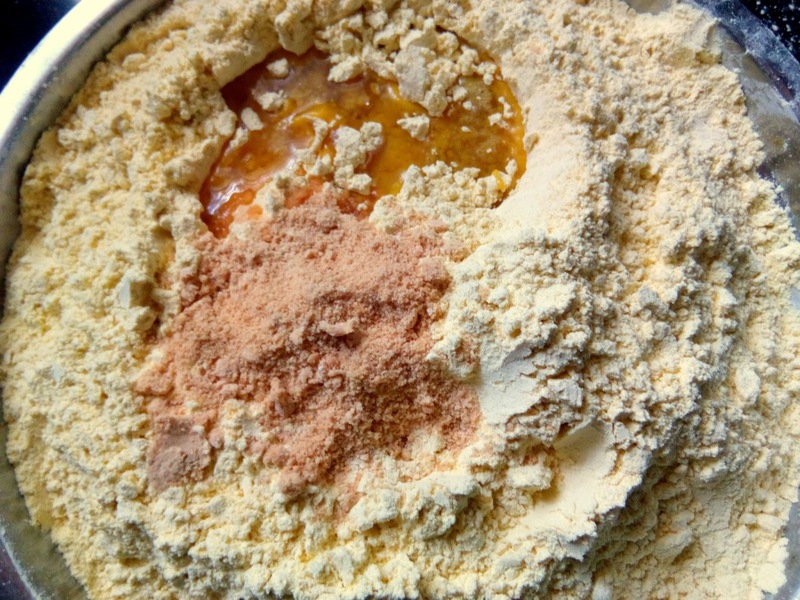 If you do not have a snacks maker to make sev, we can even make pooris out of the besan dough and then crush the deep fried pooris and follow the rest of the recipe. Sift besan , add 2 tbsp hot ghee / oil and 1 tbsp Jaggery powder(gud) to it . Using sufficient water, knead into a very soft dough. 2. Fit the snacks maker with the disc having largest pore size . Fill it with the dough. 3. Heat up ghee / oil in a deep frying pan and hold the snacks maker above it and press it to release enough sev . 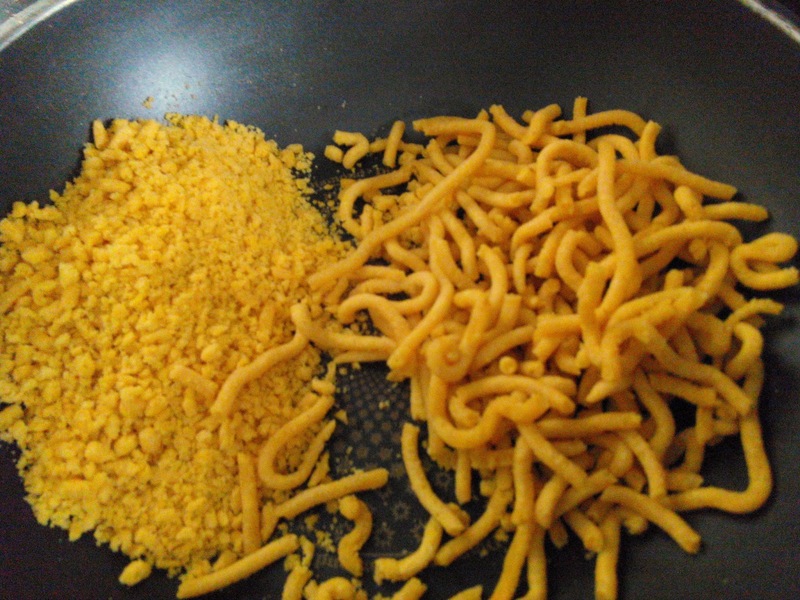 Deep fry the sev from both the sides. we do not want a very crisp sev here, also the color of sev should remain yellow , and should not turn brown( or the ladoos will look darker). 4. Remove the sev with a perforated laddle and crush it with hand when still hot enough to handle. If the sev becomes very cold, then use a mixer grinder to crush it. Repeat the same for rest of the dough. 5. 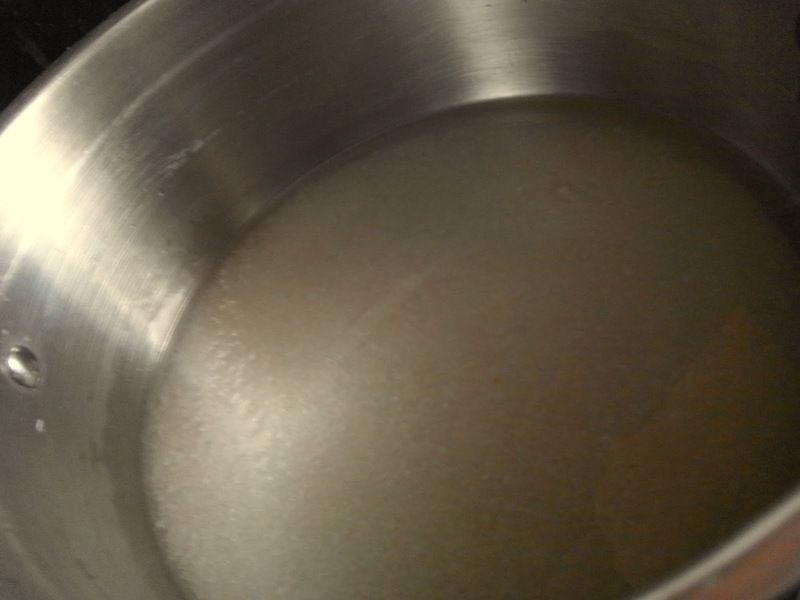 Meanwhile in a large saucepan, take 1/2 kg sugar and add water enough to cover it. Add saffron strands and heat the pan on a medium heat. Though the recipe calls for equal quantity of sugar to besan , you can always add a little less sugar , to suit your taste. For these ladoos , we look for a two string consistency of sugar syrup. 6. 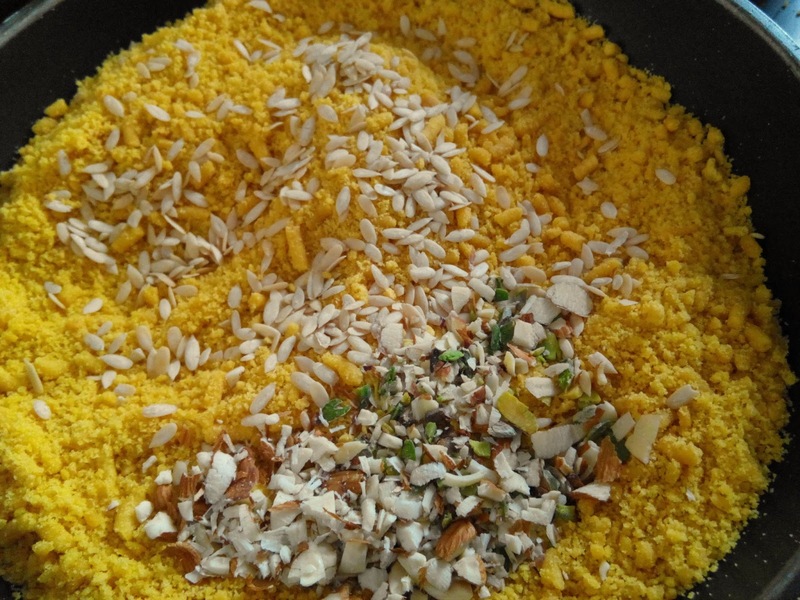 Add sliced Almonds , Pistachios and Magaj to the crushed sev . 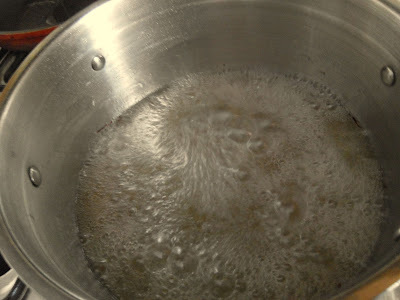 To check the 2 string consistency of the sugar syrup, take a drop of syrup on the thumb and with the index finger try to pull it, 2 threads ( strings) should appear. Another method, is to put the drop of sugar syrup into a plate having water. Try to make a ball of the syrup, if it forms the desired consistency is obtained. Put off the flame. 7. Add the sev mixture to the syrup . Add the cardamom powder and blend very well. 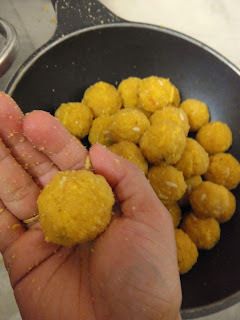 Once the mixture has cooled down a bit, enough to handle, make round balls ( ladoos). The above quantity will make 30-35 medium sized ladoos. 8. 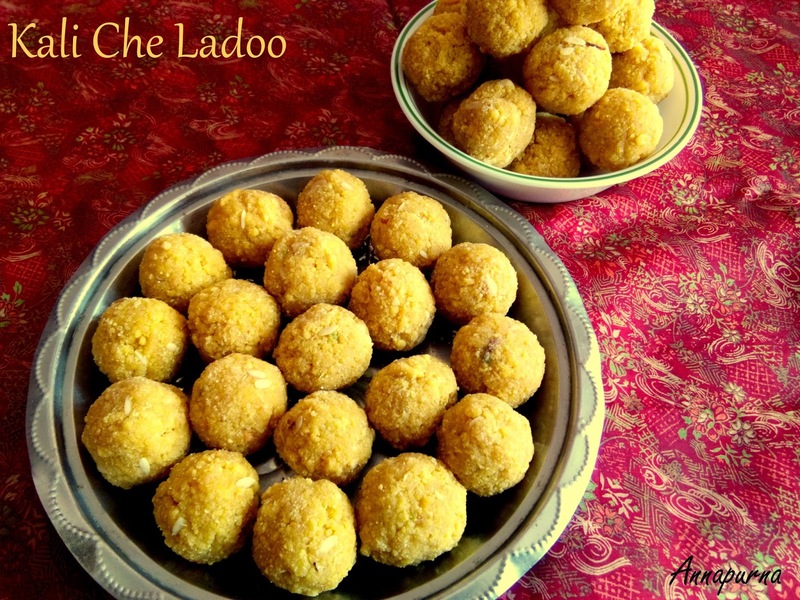 Allow the ladoos to cool down completely and transfer them to a air tight container. They can be stored at room temperature and stay good for about 10 days. Enjoy the delicious treats with your loved ones ! 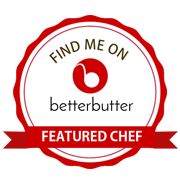 I hope you would love to give this recipe a try. Do not forget to give your valuable feed back. 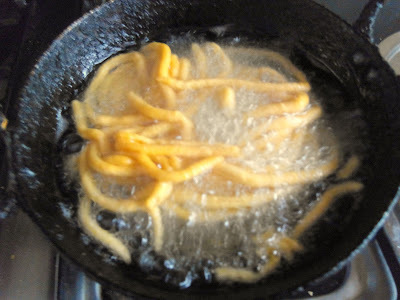 If you do not have a snacks maker to make sev, pooris can be made from the besan dough and the deep fried pooris are crushed to powder and used in this recipe. The dough should be stiff if making pooris. No artificial color is added while making the laddos. 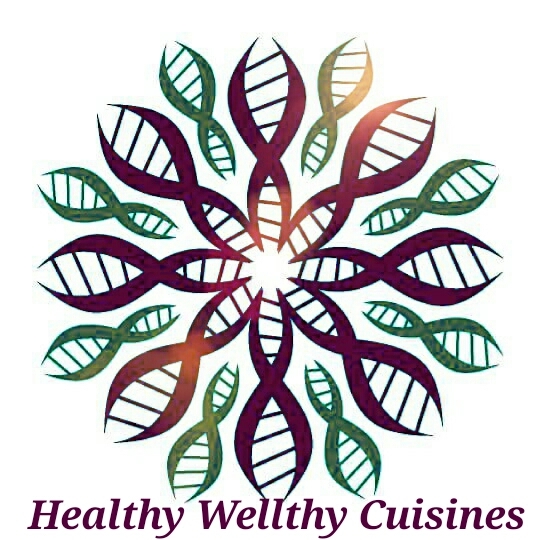 Though the recipe, calls for equal quantities of sugar and besan , you can always add a little less sugar, as per your taste. 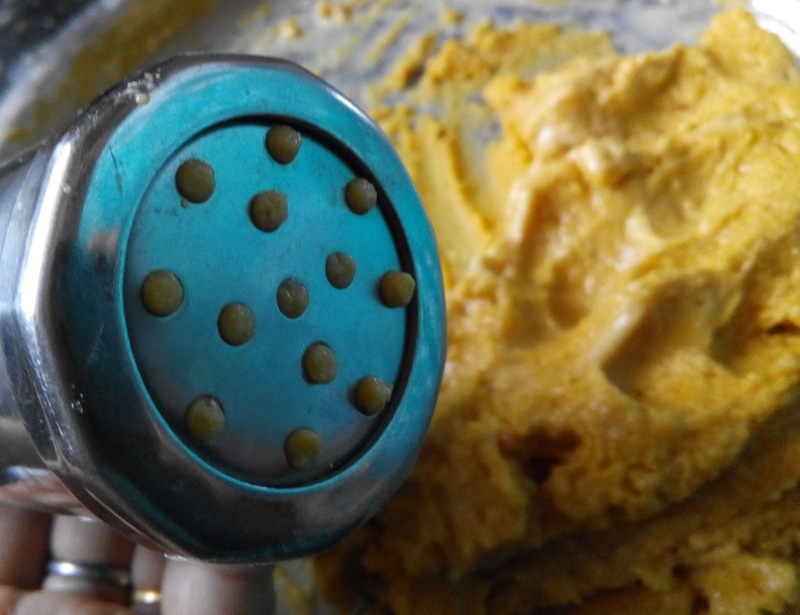 If the sugar syrup consistency is less than the desired one, the ladoos will take time to bind. And if the syrup turns more thick, the ladoos will turn hard. The above quantity yield 30-35 medium sized laddos. The quantity can be doubled , as per your requirement.